Isolated power systems (IPSs) up to 20MW capacity are traditionally based on diesel generators. Due to the high cost of diesel fuel supply, as well as environmental concerns, IPSs are increasingly integrating renewable generation. Since traditional diesel generation was built for slow changing, diesel-only systems some IPSs might experience problems in the future, while trying to support fast-changing, intermittent renewable generation. 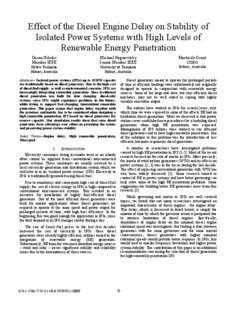 This paper argues that engine delay, together with the governor and inertia, has to be considered when designing a high renewable penetration IPS based on diesel generators for reserve capacity. Our simulation results show that some diesel generators have advantage over others in governing the system and preserving power system stability.